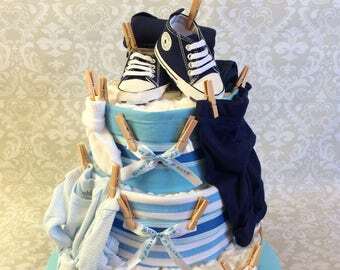 1 tier Diaper Blanket Cakes are approximately 12" tall. It contains 19 diapers. The bottom tier is 10" wide. The cake weighs 2 pounds and arrives in an 10X10X12 box. 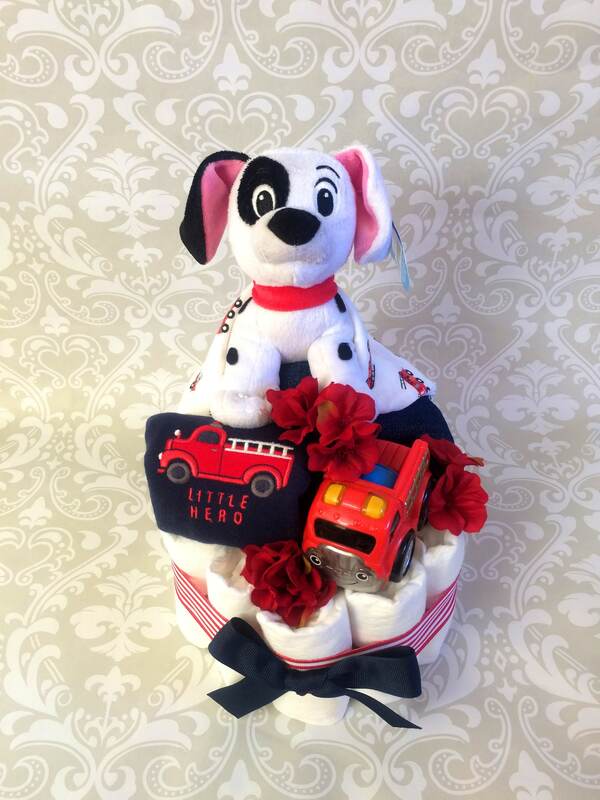 The cake is decorated with 18 Pampers Swaddlers diapers size 1, two firefighter themed onesies sized 3 months, a pair of blue jeans, a Disney 101 Dalmations plush, and a toy fire engine truck. All items on the cake are completely usable. 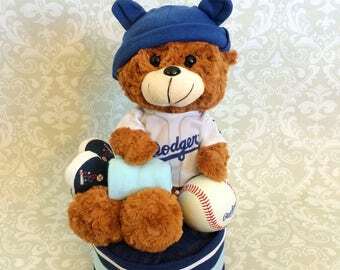 No glue is used on the diapers, clothing or plush animals. Multiple straight pins hold the creation together. Use caution when disassembling. The cake shown here is not currently available, but shows an example of what I can make for you. One tier cakes are usually $25, but this cake features a Disney plush, therefore a $5 Disney surcharge is applied to the price of the cake. This is a one of a kind creation. Due to its handmade nature it is to be handled with care and it is not intended as a toy for children. All items are made in a smoke free and pet free home. 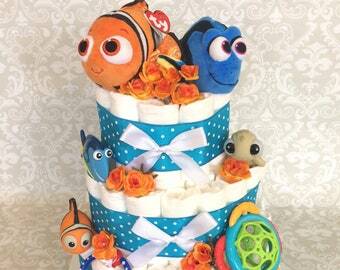 All diaper cake supplies are kept in storage cabinets away from light, dust, and heat. All yarn is kept in an enclosed cabinet free from dirt and dust.